Facebook ad submitted as evidence in Bradley v. T-Mobile. “What matters is that marketing is broadly based and inclusive, not simply focused on a particular age group. In addition, certain employers want to attract retirees or recruit for jobs with specific age restrictions like the military or airline pilots,” Goldman wrote in December in response to the original lawsuit and to the ProPublica and New York Times investigation that described the widespread practice. 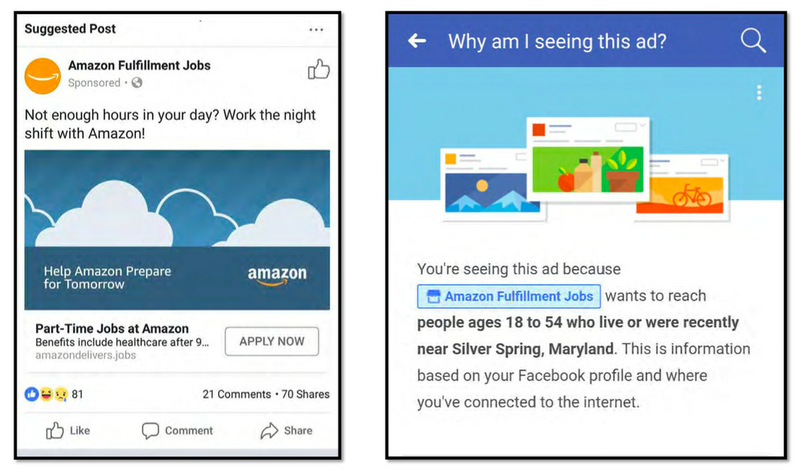 In the age discrimination case, plaintiffs want the court to order these companies, including Facebook itself, to stop posting job ads that filter out older workers. They argue that it’s a violation of the Age Discrimination in Employment Act of 1967, which makes it illegal to discriminate against workers over the age of 40 in employment advertising, recruiting, hiring, and other employment opportunities. Job discrimination against older workers is a big problem that is often overlooked in civil rights discussions. The number of age discrimination complaints submitted to the US Equal Employment Opportunity Commission (EEOC) has been rising steadily in the past 10 years, with about 18,000 complaints filed in fiscal year 2017 — about 20 percent of all complaints filed with the federal agency.